What do you get when you combine best-selling and award-winning authors, with a sprinkle of rising stars, and the ever evolving publishing industry? Shattered Lives Radio is honored to host a series of interviews with the stable of WildBlue Press authors, highlighting their careers and upcoming books, along with getting to know a great bunch of writers. 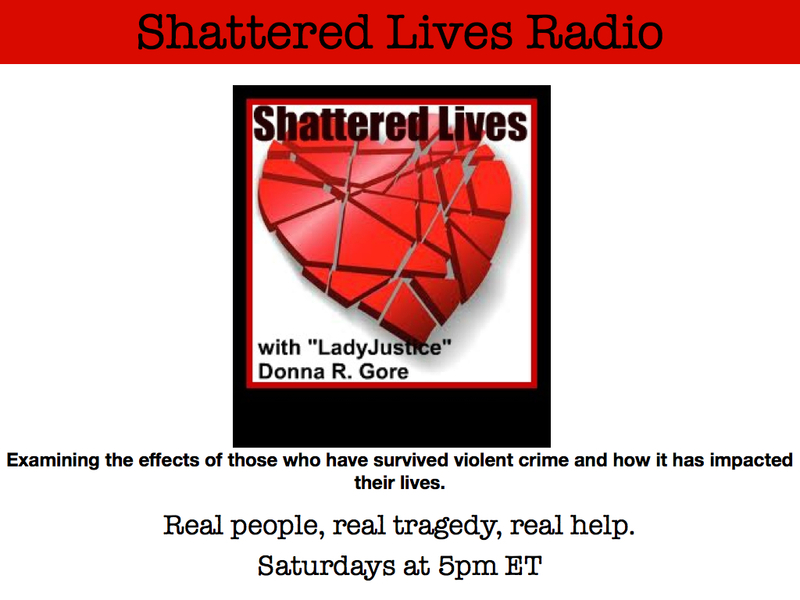 Shattered Lives Radio, hosted by Donna R. Gore, is a crime related talk show covering the aftermath of crime and tragedy with surviving victims, investigative and judicial resources, and those who advocate for them. The WildBlue Press Author Series highlights those who write about crime (true crime and crime novels), often spending countless hours researching and interviewing surviving victims and their families in order to present the facts from all perspectives. Carolina Sarassa is 3-time Emmy® award and a 4-time National Gabriel award-winning News Anchor and Correspondent for MundoFOX National Network News in Los Angeles. Prior to joining MundoFOX, Sarassa was the Anchor and Producer for Univision’s KINC in Las Vegas and a Correspondent for News Magazine show Primer Impacto. Before moving to Nevada, she anchored and reported for Univision KORO in Texas. She started her career at Aquí y Ahora, Univision’s top investigative journalistic show. She is currently working on a book for WildBlue Press tentatively titled FEAR WAS NOT AN OPTION, a true crime story with a personal twist, about two notorious LA gang members who have turned their lives around. A twenty-three year veteran of the Las Vegas Police Department, Bradley Nickell discovered a hidden talent, writing. His first endeavor, REPEAT OFFENDER, is the ultimate true crime, life on the streets of Vegas from the birdseye view of a police officer working hard to protect the community. Studies of human behavior have shown that 80 percent of the productivity in virtually every field is generated by only 20 percent of its practitioners. Whether the action is insurance policies sold, books published or practically anything else, some ratio close to 80/20 applies. Similar studies conducted by criminologists, major universities, and the U.S. Department of Justice show this ratio also pertains to crime; about 80 percent of all crime is committed by 20 percent of the criminals. These top-tier repeat offenders are classified as habitual criminals. The seasoned authors of WildBlue Press took Bradley Nickell under their wing, guiding the first time author every step of the way to publishing a quality book. REPEAT OFFENDER is offered for pre-order ahead of it’s April 14, 2015 launch date. The book’s appeal promises to be widespread among avid true crime readers as well as officers and others who work in law enforcement or the judicial system. One of the most versatile writers working today, Ron Franscell has traversed the open range of journalism, fiction and nonfiction with extraordinary success. His lyrical but muscular prose has been compared to that of Robert Olen Butler, Cormac McCarthy, and Charles Frazier. His journalism has won several national awards, including the Associated Press Managing Editors’ national Freedom of Information Award, the Investigative Reporters and Editor’s Best in the West Award, and four Pulitzer Prize candidates. And he has frequently appeared as a true-crime commentator on CNN, NPR, Fox News, and crime documentaries on Investigation Discovery, History Channel, and A&E. THE DEADLINE: A dying convict’s last request thrusts small-town newspaperman Jefferson Morgan into a deadly maelstrom as he explores a fifty-year-old case of child murder — a wound his town still isn’t ready to scrape open. Under the heaviest deadline of his life, and amid threats from unexpected foes, Morgan must struggle with his own conscience to tell a story no matter the consequences, dig deep into the town’s past, and unveil a killer who’s managed to remain hidden in plain sight for almost 50 years. THE DEADLINE was his first mystery featuring newspaperman Jefferson Morgan, followed by its sequel, THE OBITUARY. THE OBITUARY: When a world-renowned forensic anthropologist journeys to Winchester, Wyoming, to examine the long-dead remains of a woman who claimed to be Etta Place — the Old West’s most mysterious and legendary female outlaw — he’s not expecting to find a man’s headless corpse in her crypt. The grisly discovery plunges him and Jefferson Morgan — the editor of the weekly Winchester Bullet — into a shadowy and deadly world of satellite-savvy highway pirates, rural meth labs, computer hackers and old-fashioned corruption. And they might not survive the fall. In this sequel to his dynamic first novel, THE DEADLINE, bestselling author Franscell takes readers on another wild ride with protagonist Jefferson Morgan. A former investigative reporter for several newspapers across the country, Caitlin Rother left her field and pursued her dream, to be a full time writer. Her true crime books include LOST GIRLS, DEAD RECKONING, TWISTED TRIANGLE, BODY PARTS, DEADLY DEVOTION and the New York Times bestseller, MY LIFE, DELETED. Settling in her home town, San Diego, Rother teaches writing courses, coordinates writer’s events, belongs to several writer’s groups, appears as a crime expert, and offers her services as a “book doctor” and coach to aspiring writers. Her eye for detail as a journalist lends itself to writing the stories of several high profile cases, as well as her ability to develop interesting characters and plot lines in her crime fiction book, NAKED ADDICTION. Regarded as one of America’s premier investigative journalists, Burl Barer‘s true crime books such as BODY COUNT, HEAD SHOT, MOM SAID KILL, BROKEN DOLL, FATAL BEAUTY, MURDER ON 9/11, MANLING WILLIAMS’ DEADLY SINS, and MURDER IN THE FAMILY are required reading in many criminology classes and among true crime fans. Barer has appeared on numerous Investigation Discovery television shows, including Deadly Women (2011), Snapped (2011), Scorned: Love Kills (2012), Deadly Sings (2013), and Behind Mansion Walls (2013). Also in 2013, Barer served as a consultant to the television pilot series, “The Saint,” starring Adam Rayner as Simon Templar. WildBlue Press recently released the 20th anniversary edition of Burl Barer’s MAN OVERBOARD the story of the death, and resurrection, of Phil Champagne. After a boating accident, Phil Champagne is assumed dead until in 1992 he is arrested for printing counterfeit U.S. currency in an Idaho shed. He also has a fraudulently obtained passport, and a fabricated Cayman Island drivers license. He says that he didn’t fake his death but just didn’t tell anyone he was alive. Burl Barer is a Edgar Award winning author and two-time Anthony Award nominee with extensive media, advertising, marketing, and public relations experience. He is the host of the weekly radio show, True Crime Uncensored on Outlaw Radio. From the eye of an investigative journalist, John Ferak enters the controversial world of domestic violence and homicide through his latest WildBlue Press book, DIXIE’S LAST STAND. He writes with factual detail the circumstances leading to murder in the escalating violent marriage of Dixie and Scott Shanahan, and the shocking aftermath of an abused woman at the end of her rope with few options left. DIXIE’S LAST STAND opens the dialogue concerning the justification of intimate partner homicide and “battered woman syndrome” often used as a defense during trial. Was Dixie Shanahan acting in self defense, or was the murder of her husband a pre-meditated action? John Ferak’s fact-filled narrative explores the elements of Dixie’s case without judgement, allowing the reader a glimpse into this relationship, it’s terror, and the ugly consequences of family violence. For those who advocate for abuse victims, Dixie’s is definitely a case to study. A seasoned journalist, John Ferak’s first true crime book, BLOODY LIES: A CSI SCANDAL IN THE HEARTLAND, chronicles the scandal surrounding the brutal killing of a midwestern couple in their Nebraska farmhouse. He appeared on several major news outlets to discuss the CSI scandal which sent prominent CSI director David Kofoed to prison. Entering the true crime genre with his 2009 book The Bundy Murders: A Comprehensive History, Kevin Sullivan fulfilled a long time interest in true crime and history. The book was well received by readers globally and gave Sullivan entry into the community of crime authors. Sullivan has written two accounts about George Armstrong Custer and his historical “last stand” during the Great Sioux War of 1876, Shattering the Myth: Signposts on Custer’s Road to Disaster and Custer’s Road to Disaster: The Path to Little Bighorn, both gathering several good reviews. A WildBlue Press “feature” VAMPIRE: The Richard Chase Murders is an in-depth look into the life and disturbed mind of a killer, his family, and his many victims, the living as well as the dead. Within these pages you’ll discover what it was like for the police, and what a difficult job they had finding a killer they knew wouldn’t stop until he was apprehended. It was a race against time, in a series of murders that would stun even the most hardened investigators. It is the story of a city under siege, held captive by the man whose appetite for blood could not be satiated. WildBlue Press frontman Steve Jackson appears on Saturday, January 24 at 5pmET. The NY Times best-selling author gives the listeners the background on WildBlue Press then delves into his latest book, BOGEYMAN, about child serial killer David Penton told through the eyes of the detectives and their families and showing the toll a case like this has on dedicated law enforcement officers. Well known for his writing about cops, courts and criminals, his first book MONSTER made the New York Times bestseller list within two weeks of publication. Jackson is the author of nine true crime books and collaborated with former New York assistant district attorney Robert K. Tanenbaum to write eleven crime thrillers in the Butch Karp fiction series. Tune in to Shattered Lives Radio for the next several weeks to hear about the rest of the WildBlue Press authors and their latest books. Donna R. Gore, known across the internet as “LadyJustice,” brings her brand of humanitarian justice to listeners everywhere as host of SHATTERED LIVES RADIO. Donna’s experience in crime victim advocacy began with the 1981 murder of her father and that personal experience of inching through the judicial system inspires her to reach out to others in similar situations where she continues to transform a negative situation into a positive approach to life. She specializes in development of unique support resources for all victims of crime and is currently working on a future book. Her volunteer positions include being appointed the State Outreach Coordinator in Connecticut for CUE Center for Missing Persons. She is also an expert trainer and presenter for OVC TTAC through the Department of Justice on topics of crime victims’ rights, victim impact statements, and rights of the disabled. SHATTERED LIVES RADIO broadcasts live every Saturday at 5pm ET on the Inside Lenz Network, but if you can’t make the live show you can always listen to the archived podcasts at your convenience.